This city is a mad house. I don’t get lost all that easily, but today La Paz defeated me repeatedly to the tune of a couple of hours of my time. There is a vague city plan – based on colonial Spanish racial segregation – but mostly the streets wind and bend a huge the steep mountainsides. They’re so narrow you can rarely see the sun directly, let alone landmarks like distinctive snow-capped peaks and so on. But wandering and walking and figuring it out yourself is the best way to really intimately learn about a city. My wife Jasmine is always impressed by how well I know the town where she grew up – and I fairly recently moved. If I know it better than her, walking is the reason. in my wandering, I saw more than a few interesting things today. Maybe you can get some small idea of why the city is so hard to navigate. I spent an hour or so outside of the Presidential Palace this morning. The media were massed, and there seemed to be anticipation in the air. I was hoping for a glimpse of Evo Morales, Bolivia’s first full-blooded native – that is non Spanish, non-mestizo – president. I was disappointed in this, but I did get to admire a few of the more quirky, symbolic gestures he has made firsthand. This clock on the front of the legislature, for example, looks like it is a mirror image of a normal clock. In fact, it is Morales’s way of displaying native pride – native of the Southern Hemisphere, that is. Our standard clock was developed in the Northern Hemisphere following the model of a sundial – which appears to run opposite in the Southern Hemisphere, hence this highly political clock. There’s your science lesson for today. Morales has also renamed the entire country, whose formal name is now the Plurinational State of Bolivia, which is meant to reflect the diverse ethnic and racial composition of the nation. If all of this seems pretty heavy-handed, you have to understand just how rigidly the Spanish divided their colonial populations based on race. Even pure-blooded Spanish-born in the colonies were second class to those born in Spain proper, and there were gradiations based on every possible racial combination of your ancestors, with native peoples hugging the bottom rungs of society. So, these are broad gestures in the light of historical wrongs. One of the final stops of the day was to the infamous witch market, where Bolivian folk remedies and spirituality are on full display. 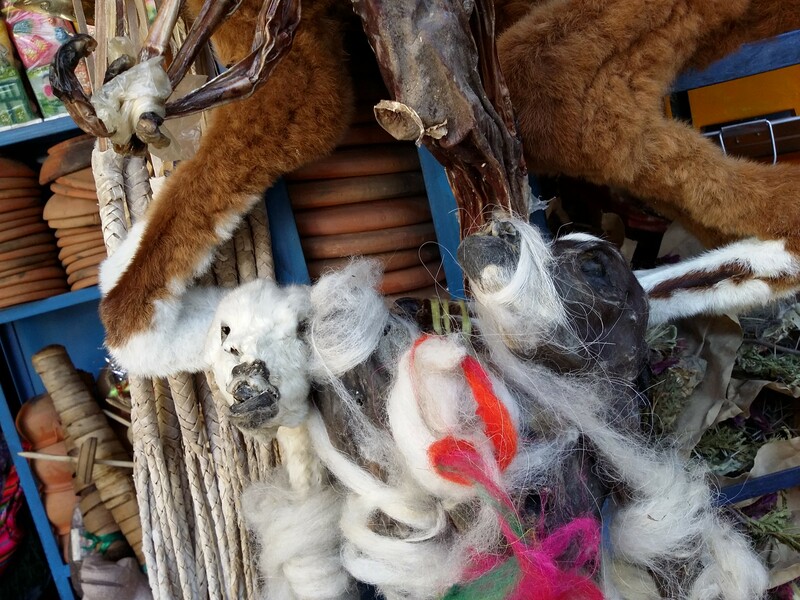 The most striking example for most tourists are these fetal llamas, used by shamans in a ritual to bless a new construction, such as a house. Pretty wild, the persistence of these old ways, despite the best efforts of the Spanish to suppress them! 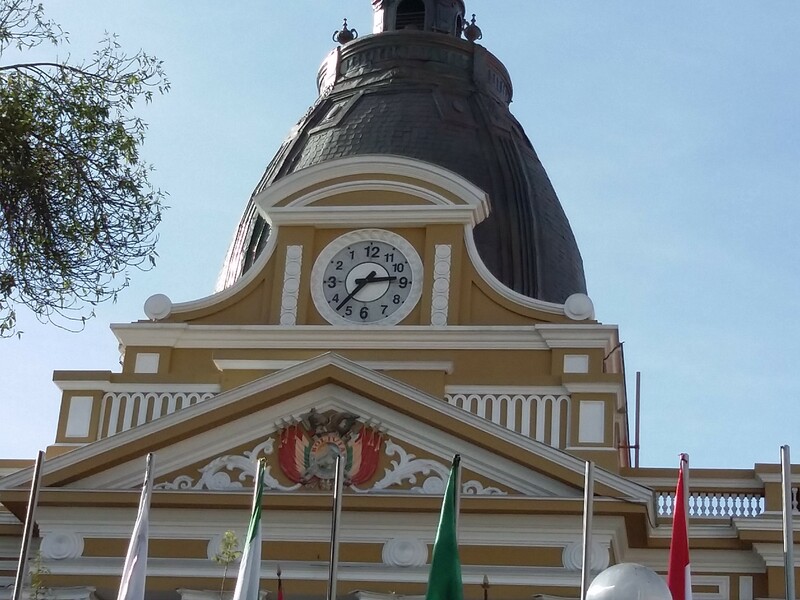 Culture is a resilient thing, and Bolivia is a far richer place for the incomplete success of the Spanish.